Black birch handle. 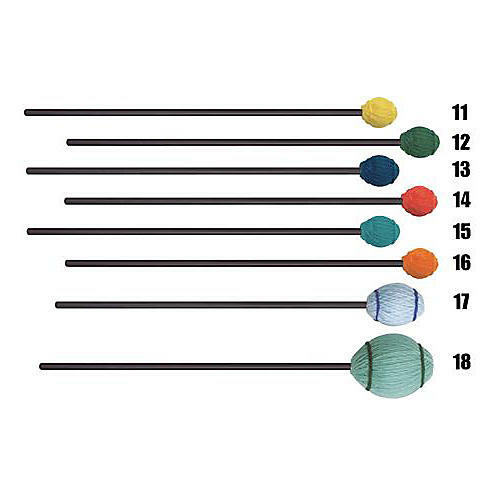 Choose by number key: (11) yellow yarn hard, (12) green yarn medium hard, (13) blue yarn medium, (14) red yarn medium soft, (15) aqua yarn soft, (16) orange yarn extra soft, (17) light blue yarn extra soft, or (18) light green yarn bass. What is behind the Mike Balter name? Pride, Commitment, Integrity, Experience, in addition, you are assured of perfect weight and balance, along with superb craftsmanship. The Mike Balter Advantage guarantees genuine dedication to providing products of unsurpassed quality. Mike Balter has focused exclusively on designing and perfecting the production of the industry's finest mallets. Mike Balter Mallets are made to exceed the most demanding professional standards. The Mike Balter Advantage starts at the top with Mike himself and continues in every step of the production process. Every custom-crafted mallet has an advantage you can see, an advantage you can feel, and an advantage that you can hear with every stroke. Your advantage is the name... Mike Balter. MIKE'S PERSONAL GUARANTEE - It is my name that appears on every mallet. Because of this fact, Mike Balter products have the strongest guarantee in the industry. You have my personal guarantee that Mike Balter Mallets will exceed your expectations. Mike Balter Mallets are, indeed, a stroke to perfection.